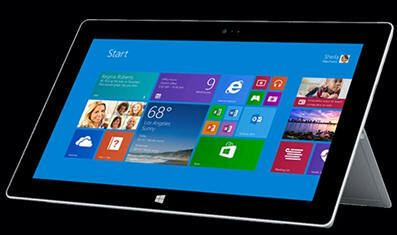 October 2, 2013 - Delta Air Lines is equipping its 11,000 pilots with the Microsoft Surface 2 tablet, which will be used initially as an electronic flight bag to replace heavy paper-based flight kits containing navigational charts and aircraft operating and reference manuals. Device rollout to pilots flying the Boeing 757 and Boeing 767 fleets will start later this year and all Delta cockpits are projected to be paperless by the end of 2014. Rolling out the Surface 2 tablets across the entire fleet and eliminating paper in the cockpit means the carrier will remove traditional 38-pound pilot flight bags maintained on board aircraft for each pilot. That critical weight reduction is expected to reduce fuel usage by an estimated 1.2 million gallons per year which translates to a 26-million-pound reduction in carbon emissions the equivalent of taking more than 2,300 passenger cars off the road. Additionally, the tablet will cut the airline’s paper usage by 7.5 million sheets annually and save an estimated 900 trees each year.